The flowers have blossomed and we can’t wait to fill our house with their fragrance and vibrancy. Flowers bring a liveliness to the interiors and they can instantly brighten up the vibe of any area. In order to decorate a living place with flowers, they have to be kept alive and beautiful. 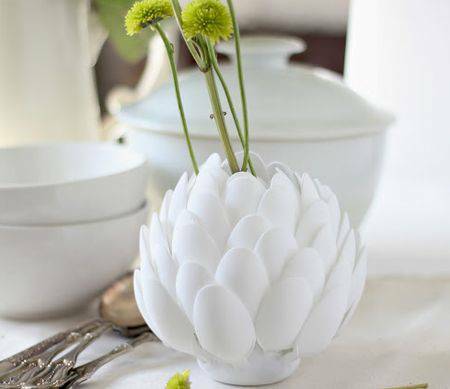 Today we will be sharing with you DIY activities to create your own vase. These Vases will certainly enhance the charm of the flowers and hence will modify the decor of your home. The very first activity might seem like it requires professional assistance, but, like many cases, appearances here too are deceptive. This is an interesting method to create a beautiful vase and you will require a clean glass vase for this along with craft colors. Start by adding few drops of one color to the vase and then add another color on top of it. 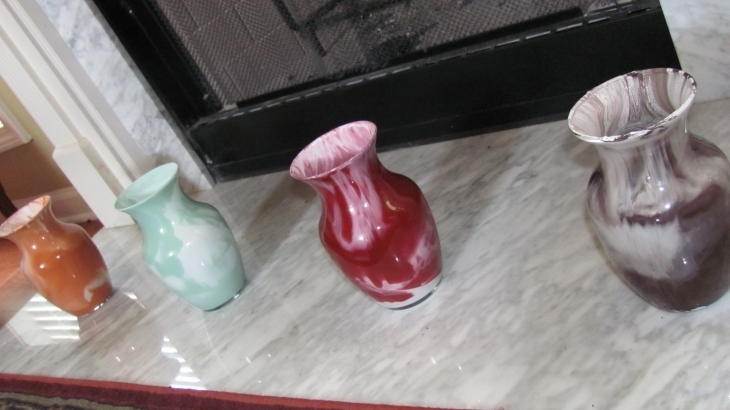 Now slowly begin to swirl the glass vase and keep adding color drops, again one color at a time. Don’t forget to be slow so that colors get time to settle and get dry. This will help to keep the design intact. Do not add water to the colors. You want the colors to be thick so that they dry quickly and do not create a mess. Once you finish, let it dry for at least 24 hours before you start using it. This activity requires time and patience but it is worth the effort since the result is nothing but sheer elegance. We highly recommend this activity since it involves reusing and recycling. You don’t need any particular type of vase for this. In fact, you can use any old object which you think can hold water and flowers. 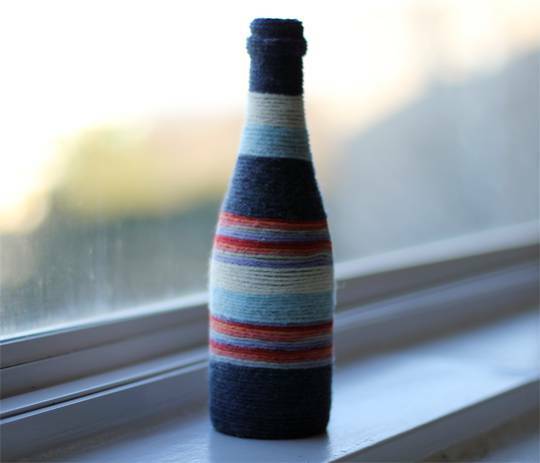 You also need knitting yarn for this DIY. All you have to do is cover the object with yarn threads and your brand new vase is ready. You can choose as many colors you want and follow any pattern that you like. 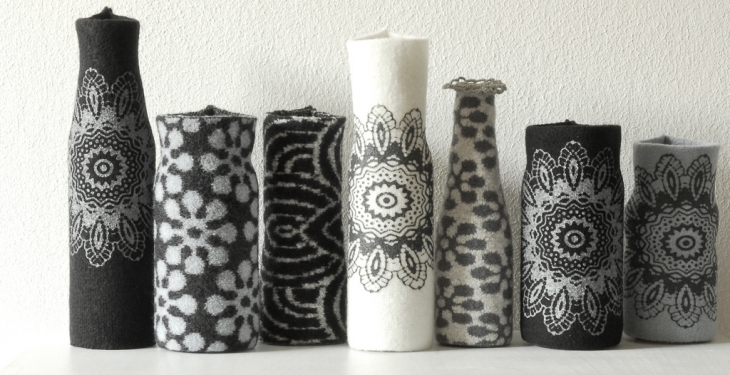 The easiest thing to do would be to cover the object/vase with different color yarn threads in a stripe pattern. Stipes are classy and never go out of style. 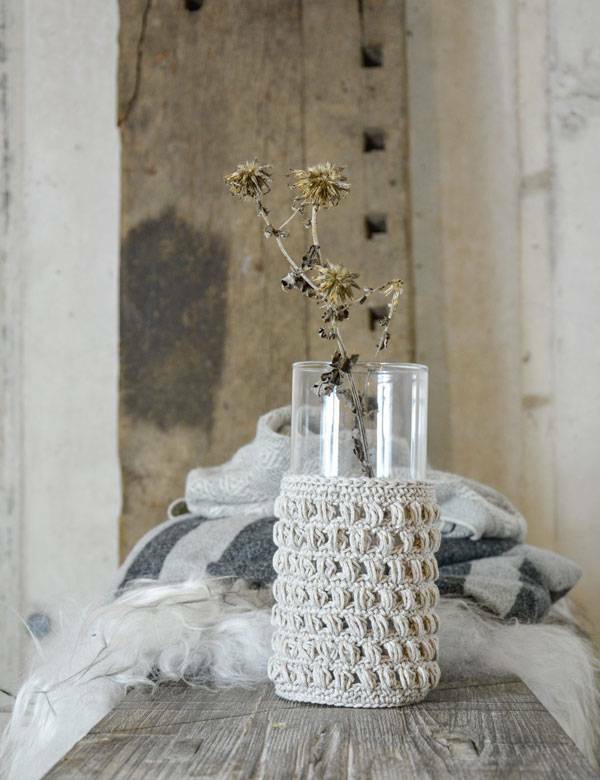 You can also cover your vase with a ready made knitted sweater that you don’t use anymore. Cover you vase with a piece of lace. You will need the help of a hot glue gun for this one. 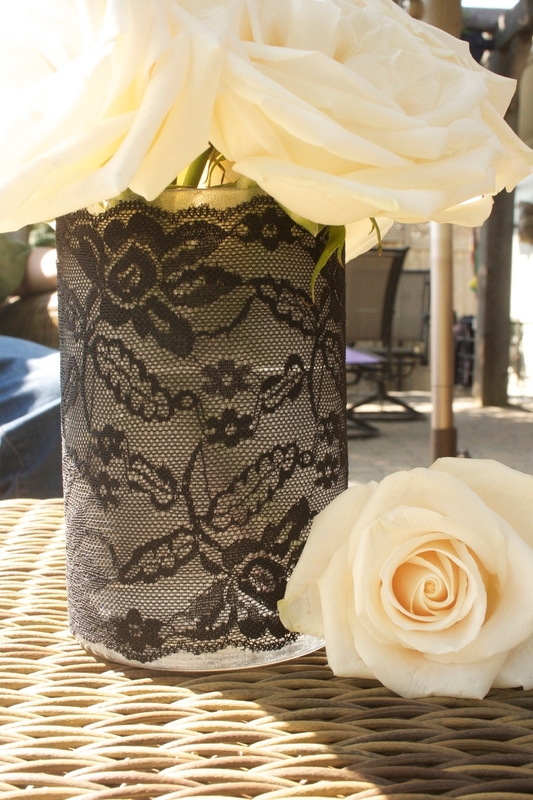 Adding a piece of lace will provide an instant vintage charm to your vase and will not take much time. You don’t have yarn, you don’t have lace. A rope, on the other hand, is more accessible and the texture it provides is timeless. Create a vase by covering any object of your choice with rope and add colorful flowers to the vase. Use hot glue gun to hold the rope. It is again time to reuse and recycle. Bring your disposable spoons to use. Use the heads from those spoons to cover your vase. You need to stick the heads on the vase, placing them next to each other. When you finish you will see the spoons have formed a flower like design. You can let them remain the same way or can color them with spray paints. This is a simple activity. 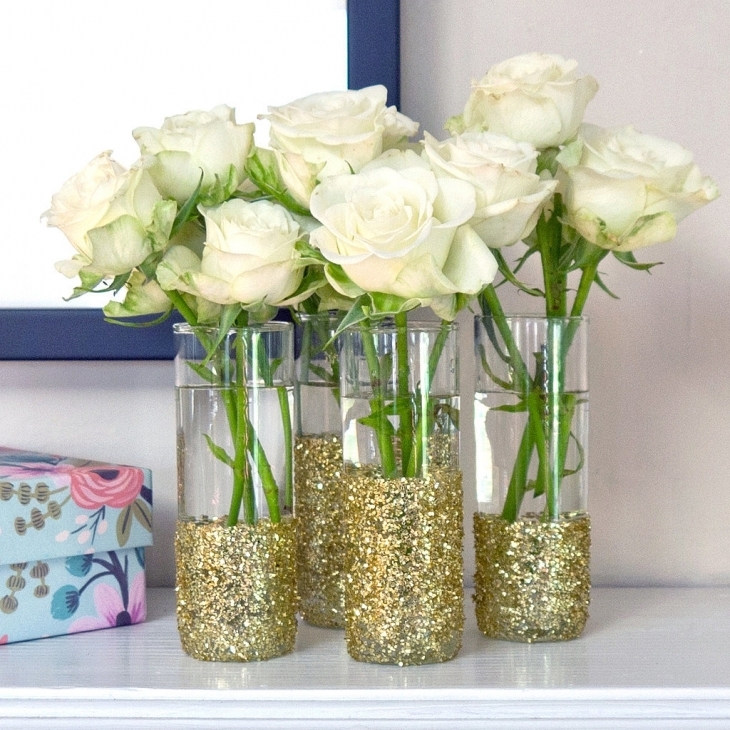 Just cover the vase with your favorite glitter and let them dry. Once dried add a coat of white glue over the glitter to seal them completely, making the design last for a long time. 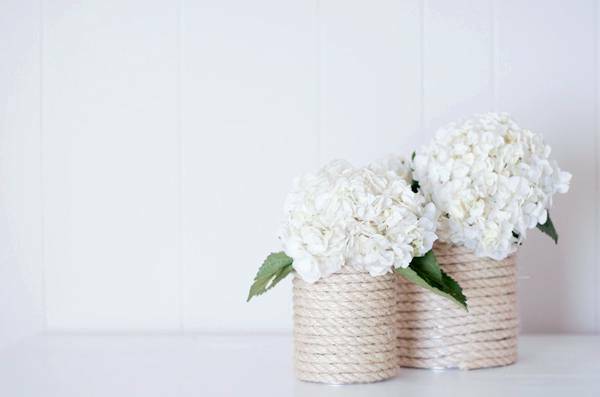 These are some easy ways to create vases at home without much investment. We hope you try them and enjoy indulging in these fun DIY activities.You can also use these vases to present as a gift to someone as a housewarming gift.